Text: April 30. — I have already given a literal translation of one of those lyric pieces which are introduced in many English farces, and are often sung between he play and the farce. At Edinburgh we heard Bannister, and here Mathews, sing some of these select pieces with a great deal of true comic, and what is called here dry humour. Yesterday, particularly, Mathews delighted the public of the Lyceum in a new play, called the Bee-hive, played forty times running. The song of an inn-keeper, who enumerates the contents of his larder and kitchen, was encored again and again, with frantic applause. Other songs, however, which happened to be less in the popular taste, were received with coolness, and we heard some men behind us exclaim, among themselves, “Italian squalls!— What a shame, on a British theatre, — Just like the opera by G— !” Whenever I have expressed any surprise at the state of the English stage, I have been told that it was only the amusement of the vulgar, and that if I chose to partake of it, I must not complain. Admitting that people of fashion scarcely ever go to the theatre, yet the lowest of the people do not frequent it more then they do; — it is in fact filled by the middle class, neither the highest nor the lowest, and that is precisely the class where I should look for the true and legitimate national taste. Besides, if the theatres of Covent-Garden and Drury-Lane are for the vulgar, what other is there left for those who rank themselves above the vulgar? The opera, — in other words, there is no national theatre. Comments: Louis Simond (1767-1831) was a French travel writer. He journeyed through Britain over 1810-11, writing his published account in English. The Bee-hive was a two-act music farce with libretto by John G. Millingen and music by Charles E. Horn. Text: As soon as dinner was over, which admits of no ceremony, we were conducted to the theatre, where a company of players were in readiness to perform a dramatical entertainment. The drama was regularly divided into three acts: the first consisted of dancing and dumb shew; the second of comedy; which to those who understood the language was very laughable, as Omai and the natives appeared highly diverted he whole time; the last was a musical piece, in which the young princesses were the sole performers. There were between the acts some feats of arms exhibited. The combatants were armed with lances and clubs. One made the attack, the other stood upon the defensive. He who made the attack brandished his lance, and either threw, pushed or used it in aid of his club. He who was upon the defensive, stuck the point of his lance in the ground, in an oblique direction, so that the upper part rose above his head, and by observing the eye of his enemy, parried his blows or his strokes by the motion of his lance. By his dexterity at this manoeuvre he turned aside the lance, and it was rare that he was hurt by the club. If his antagonist struck at his legs, he shewed his agility by jumping over the club; and if at his head, he was no less nimble in crouching under it. Their dexterity consisted chiefly in the defence, otherwise the combat might have been fatal, which always ended in good humour. These entertainments, which generally last about four hours, are really diverting; their dancing has been much improved by copying the European manner. In the hornpipe they really excel their masters: they add contortions of the face and muscles to the nimbleness of the foot, that are inimitable, and must, in spite of our gravity, provoke laughter; their country dances too are well regulated; and they have dances of their own, that are equal to those at our best theatres; their comedy seems to consist of some simple story, made laughable by the manner of delivery, something in the style of the merry andrews formerly at Bartholomew fair; and their singing is very simple, and might be much improved. Had Omai been of a theatrical cast, he doubtless might have very much improved their stage; for their performers appear inferior to none in the powers of imitation. The play being over, and night approaching, our commanders took their leave, after inviting the king and his attendants to dine on board the ships. We were conducted to the water-side in the same manner as we approached the palace, and were attended by the king and royal family. Comments: John Rickman (1737-1818) was Second Lieutenant on the explorer Captain James Cook’s third and final voyage, 1776-1780, to New Zealand, the Hawaiian islands and the Bering Strait, in covert search of a North West Passage. Cook was killed on their return to the Hawaiian islands. Rickman kept a log of the journey which was published anonymously in 1781. This passage comes from the visit paid by Cook’s two ships, Resolution and Discovery, to Tahiti in August 1777 (the official purpose of the voyage was to return the Pacific islander Omai, who had been to England, to his home). Cook had first visited Tahiti in 1769, and again in 1773-74. Text: In the evening we went to the Italian comedy, which was so tiresome that we could not endure more than one scene. We drove afterwards to the opera. The theatre large and handsome;— six tiers of boxes. The seats in the pit are numbered, and divided off separately with elbows:— so that you may take any one of them in the morning, and secure it for the whole evening. Some plan of this kind would surely be a great improvement in our own theatres. The dancing was bad, and the singing worse. A set of burlesque dancers amused us afterwards, by aping the pirouettes of the others. The dancing of the stage gives but too much foundation for such caricatures. It is daily becoming less elegant, as the difficult is substituted for the graceful. What can be more disgusting than to see the human figure twirling round with the legs at right angles? In such an attitude, “Man delights not me nor woman neither.” All postures to be graceful should be easy and natural, and what can be more unnatural than this? Comments: Henry Matthews (1789-1828) was a British judge. On account of ill health, he went on a recuperative tour of Europe over 1817-1819. The published diary of his travels, The Diary of an Invalid (1820), was very popular and went through a number of editions. The two-volume diary has several entries on theatregoing. The theatre he visited in Rome may have been the Teatro Argentina. Text: October 5 … Last night Café Savoy. Yiddish troupe. Mrs. K., “male impersonator.” In a caftan, short black trousers, white stockings, from the black vest a thin white woolen shirt emerges that is held in front at the throat by a knot and then flares into a wide, loose, long, spreading collar. On her head, confining her woman’s hair but necessary anyhow and worn by her husband as well, a dark, brimless skull cap, over it a large, soft black hat with a turned-up brim. I really don’t know what sort of person it is that she and her husband represent. If I wanted to explain them to someone to whom I didn’t want to confess my ignorance, I should find that I consider them sextons, employees of the temple, notorious lazybones with whom the community has come to terms, privileged shnorrers for some religious reason, people who, precisely as a result of their being set apart, are very close to the center of the community’s life, know many songs as a result of their useless wandering about and spying, see clearly to the core the relationship of all the members of the community, but as a result of their lack of relatedness to the workaday world don’t know what to do with this knowledge, people who are Jews in an especially pure form because they live only in the religion, but live in it without effort, understanding or distress. They seem to make a fool of everyone, laugh immediately after the murder of a noble Jew, sell themselves to an apostate, dance with their hands on their earlocks in delight when the unmasked murderer poisons himself and calls upon God, and yet all this only because they are as light as a feather, sink to the ground under the slightest pressure, are sensitive, cry easily with dry faces (they cry themselves out in grimaces), but as soon as the pressure is removed haven’t the slightest specific gravity but must bounce right back up in the air. They must have caused a lot of difficulty in a serious play, such as Der Meshumed by Lateiner is, for they are forever – large as life and often on tiptoe or with both feet in the air – at the front of the stage and do not unravel but rather cut apart the suspense of the play. The seriousness of the play spins itself out, however, in words so compact, carefully considered even where possibly improvised, so full of the tension of a unified emotion, that even when the plot is going along only at the rear of the stage, it always keeps its meaning. Rather, the two in caftans are suppressed now and then, which befits their nature, and despite their extended arms and snapping fingers one sees behind them only the murderer, who, the poison in him, his hand at his really too large collar, is staggering to the door. The talmudic melody of minute questions, adjurations or explanations: The air moves into a pipe and takes the pipe along, and a great screw, proud in its entirety, humble in its turns, twists from small, distant beginnings in the direction of the one who is questioned. October 6. The two old men up front at the long table near the stage. One leans both his arms on the table and has only his face (whose false, bloated redness with an irregular, square, matted beard beneath it sadly conceals his old age) turned up to the right toward the stage, while the other, directly opposite the stage, holds his face, which old age has made quite dry, back away from the table on which he leans only with his left arm, holding his right arm bent in the air in order better to enjoy the melody that his fingertips follow and to which the short pipe in his right hand weakly yields. “Tateleben, come on and sing,” cries the woman now to one, now to the other, at the same time stooping a little and stretching her arms forward encouragingly. The melodies are made to catch hold of every person who jumps up and they can, without breaking down, encompass all his excitement even if one won’t believe they have inspired it. The two in caftans are particularly in a hurry to meet the singing, as though it were stretching their body according to its most essential needs, and the clapping of the hands during the singing is an obvious sign of the good health of the man in the actor. The children of the landlord, in a corner of the stage, remain children in their relationship to Mrs. K. and sing along, their mouths, between their pursed lips, full of the melody. Comments: Franz Kafka (1883-1924) was a Bohemian Jewish novelist and short story writer, author of ‘Die Verwandlung’ (‘The Metamorphosis’) and Der Process (The Trial). He first encountered Yiddish theatre in his home city of Prague in 1910, and between September 1911 and January 1912 documented in his diary his close interest in a Yiddish theatre group that performed at the Café Savoy. The entertainments were a mixture of songs, turns, jokes and plays. The play Kafka saw was the prolific Yiddish playwright Joseph Lateiner‘s Der Meshumed (The Apostate). His impressions were recorded over two day entries in his diary, and he goes on to describe the action of the play in great detail. Mrs K was the actress Flora, or Florence, Klug. A šlapák was a type of dance. Kafka’s diary reveals how the theatre troupe affected his imagination and his dreams, with elements of this helping to inform his subsequent novels. After this Tich makes some patter and when the chorus breaks out again, there is a crescendo of laughter and applause. Tich becomes tremendously animated and does a wonderful little dance, slapping his boots together in mid-air. He throws up his hat and in his ecstasy throws away his little stick. This aberration suddenly halts the whole show. The band stops: while Tich tries to move towards recovering his hat but hesitates and turns to the direction of his stick, and then changes his mind again, and so on, until he is demented with worry. However, the band creep in sotto voce and this seems to encourage him to pick up his stick firmly. But as he stoops to gather up his hat, the toe of his long boot pushes the hat ahead, sometimes it goes only just out of reach, sometimes it positively jumps like a frog, Then suddenly Tich either kicks it, or hits it in a miraculous way so that it spins into the air and he catches it on his head. This is the signal for the band to open up again. Tich resumes his dance and amid a storm of applause the turn is over. Comments: Paul Nash (1889-1946) was a British artist, linked to the Surrealists, and serving as an official war artist in both world wars. His unfinished autobiography was published posthumously in 1949, ending just before the First World War with memories of this visit to the Oxford Music Hall in London. Harry Relph (1867-1928), known professionally as ‘Little Tich‘ was one of the great figures of the English music hall. 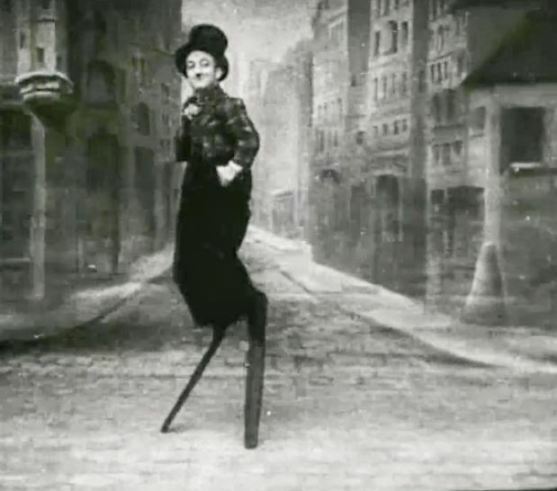 He was four feet six inches high, and his best-known turn was the ‘big boots’ routine. Text: After triumphing brilliantly a couple of years ago as Alfred De Musset‘s youthful, effeminate Lorenzaccio – a Florentine Hamlet – Madame Bernhardt aspired to impersonate Shakespeare’s towering hero, and through this venturesome ordeal, on which the courageous artiste set her heart, she has passed with truly remarkable success. Not that the performance leaves no room for criticism – quite the reverse – but it is attractive, curiously fascinating in its singularity and will doubtless create much interest at your side. Here the new Hamlet has been received with enthusiasm, the actress’s thick and thin admirers going into the wildest ecstasies the first night, while succeeding audiences have cordially confirmed this favourable verdict. The new prose version of the play is to all intents and purposes a literal translation, written in sound style, and rather too accurate, perhaps, the close adhesion to the English text causing at times a certain amount of obscurity. But MM. Morand and Schwob’s reading, if somewhat heavy, must be pronounced far and away more satisfactory than that of Dumas and Maurice, which is in verse, or than that of MM. Cressonois and Samson, also in verse, which we saw at the Porte-St.-Martin some thirteen years since, when, by-the-way, Madame Sarah Bernhardt played Ophelia to the Hamlet of M. Philippe Garnier, a part that did not suit her talent. Excessive length is a drawback to the new play. No fewer than fifteen scenes were presented on Saturday, witha pretty long wait between each, shifting being still in its infancy on our stage, so that half-past one had struck before the curtain fell. Pruning and splicing have since been adopted, three scenes have been cut out, but still, starting at eight, the close is not reached until a quarter past twelve. And during all that time the spectators have eyes and ears (or nobody but Madame Bernhardt, though Ophelia’s mad scene, with Mdlle. Mellot’s pretty singing, seems to please them. So poor is the rest of the cast that the celebrated actress forms the sole attraction, and it must be said she proves equal to the occasion. As a general rule, Madame Bernhardt throws herself into a rôle for ten minutes in each act; during the remainder of the time she merely dallies with it. In the present instance her energy never flags, and apart from occasional want of action, a manifest reluctance to express passion otherwise than by voice, remaining stock still when she should move about – as in the comparison of the portraits, which are painted (very badly) on the wall, not in lockets – the actress exerts herself with an intensity so untiring that it is marvellous how she can bear the strain of such arduous efforts. Her interpretation shows, as I have said, attractive singularity. Far from being “fat and short of breath,” the new Hamlet is a vivacious, excitable, almost fidgetty stripling, whose febrile agitation bears no resemblance to our ideal of the musing, melancholy Dane. I heard people say that this rendering of the part made it more comprehensible than any they had hitherto seen, and fully coincide in their view. The hesitation, the weakness, and the inability of such a slender youth to cope with the difficulties of the terrible task he has set himself are too obvious to need any explanation or reflection. They “jump to the eyes,” as the French say, simplifying exceedingly the signification of the complex rôle. But is this nervous, impetuous Hamlet Shakespeare’s? I think not. At Madame Bernhardt’s hands he loses his earnestness, the dreamy, tristful features of his character as good as disappear. Nay, he becomes so waggish, that even in the dialogue preceding the play some his gamierie prompts him to pluck the cap off the head of the candle lighter! Despite, however, blemishes of the sort that render Madame Bernhardt’s delineation untruthful, it is undoubtedly attractive. In the scenes with the Ghost she is admirably effective, and though the soliloquies – more especially the most famous of them – are delivered in the monotonous, clanking tones which the actress has adopted, her elocution is telling throughout, her attitudes and gestures are graceful. The performance is more emotional than impressive; feminine in its feverish restlessness and excessive juvenility. Some of the “business” deserves notice. In the Play scene the King and Queen take their places on a sort of high dais, to which steps lead up on either side, the front resembling that of a pulpit, forming an inverted V with the point cut off. On the floor below Hamlet reclines on cushions by Ophelia’s side, and raising himself to watch Claudius, screens his face with the girl’s long flaxen tresses instead of with the traditional fan. In the end his excitement leads him to climb the barrier, and, when the conscience stricken monarch rises, Hamlet, seizing a torch from the footlights, thrusts it into the face of his father’s murderer, who rushes off screaming with terror. This arrangement of the scene struck me as fantastic, for, by having to peer over the balustrade, Hamlet is obliged to betray his purpose before it is attained, but Claudius does not seem to notice him, being intent on the play beyond. In the Churchyard scene, neither Laertes nor Hamlet leap into the grave, and at its close the latter falls on the heap of newly dug earth. Laertes and the Prince are each armed with a rapier and dagger in the concluding scene, but do not employ the latter weapon. Hamlet, when pinked in the hand, takes off his glove, and, perceiving Laertes start and shudder on seeing the blood flowing from the wound, divines the treachery. Setting upon his adversary in a furious bout, he disarms him, and as Laertes hastens to pick up his sword, prevents him by placing himself before it, offering him his own rapier with a glance and gesture too significant to be denied, taking the poison weapon himself. This modification to the customary exchange “while scuffling” seems to me an improvement. Little else need, I think, he said of the performance. Madame Bernhardt’s company do not shine in it, and with the exception of Mdlle. Mellot, whose pleasing singing has been already noticed, but otherwise an insignificant Ophelia, there is not a name to mention, all being below mediocrity, provincial and stagy to a degree. The scenery is very handsome, the scenic arrangements faultless, and the costumes are in perfect taste, except that of the King, which is hideous; he looks like an old woman. Madame Bernhardt has fair hair falling low on the neck, and wears a short black satin tunic bordered with sable, long black hose, and a long, narrow silken black cloak which trails slightly. A soupçon of white ruffles on the breast is the only relief to this sombre garb, which makes the gifted actress look more slender than ever. Some impressive incidental music has been contributed by M. Gabriel Pierné, and Ophelia’s song is pretty. 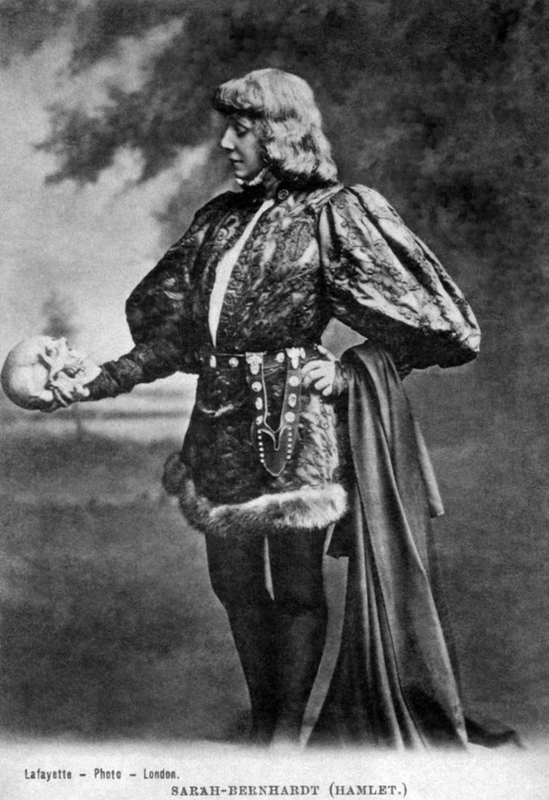 Comments: Sarah Bernhardt (1844-1923) first played Hamlet on 20 May 1899 at the Théâtre Sarah-Bernhardt in Paris, in a prose translation by Eugène Morand and Marcel Schwob which ran for around four hours. The production moved to the Adelphi Theatre in London on 12 June, with a single performance at the Memorial Theatre in Stratford on 29 June. The duel scene from the play was filmed, with accompanying sound effects, for the Phono-Cinéma-Théâtre, which was an attraction at the Paris Exposition of 1900. Mme Judith played Hamlet in 1867. The Era was a British theatrical trade journal, hence the reference to “at your side”.